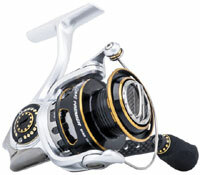 It starts with our advanced aluminum machined gear system that gives anglers ultra-smooth gear feel and performance. To reduce weight, the Premier uses high-end components including an IM-C6 body design, a C6 integrated rotor, a carbon fiber handle and an EVA knob. Casting efficiency is maximized by the Rocket Line management system that improves casting distance while reducing wind knots. Slow Oscillation provides even line lay with all types of line, Flat EVA knob provide greater comfort and durability, Everlast bail system for improved durability, Aircraft grade aluminum main shaft, Titanium main shaft (40 size only), K-Clutch anti reverse.